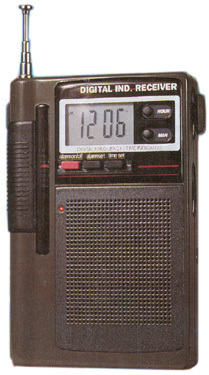 The Kaiwa KA-818 is an inexpensive pocket-sized digital portable that covers AM (525-1610 kHz), FM (87-108 MHz) and six shortwave bands. The six shortwave bands are: 5.9-6.4, 7-7.5, 9.5-10, 11.6-12.1, 15-15.6 and 17.5-18.3 MHz. 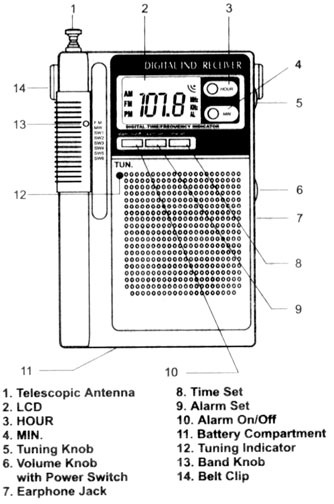 This radio has a built-in clock (12 hour format) which will turn the radio on at a programmed time. The KA-818 controls are easy to use. Earphone jack for private listening (earphone not supplied). Belt clip included. Requires two AA cells (not supplied). Size: 2.7 x 4.5 x1 inches 5 oz. (70x115x25mm 140g). Copyright 2002-2009 Universal Radio, Inc.